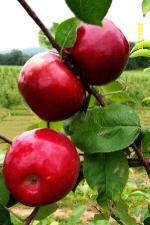 Description Attractive, high quality McIntosh-type dessert apple that is medium in size, with 90% dark red color. Fruit is firm and crisp, ripening just ahead of McIntosh. Tree is medium sized, very productive, and an annual bearer. Pollination Information Jonamac is an early blooming variety and can pollinate all other early blooming apple varieties as well as varieties with mid-season bloom times.